You thought the Trunk Monkey was cool? You haven’t seen my car. I’m driving down the road. There’s some sort of congestion up ahead. I can see all of the cars ahead of me slowing. Red brake lights, everywhere. There’s a passenger with me. I pause briefly as I wonder if there is any way around the mess of cars. I realize I’m stuck in traffic. We carefully slow to a stop. We’re going to be here for a while. We’re going to be late. I glance over at my passenger. We exchange mild conversation and complain about the traffic. And then it all changes because I have a special button in my car. A special button no one else has and that makes my car unique. My car has rocket thrusters and can fly! 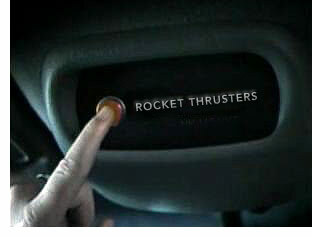 I push the rocket thruster button and immediately my car jumps into the air. It hovers gently at first, just above the pavement. “Whoa dude! !” my passenger exclaims with surprise. I glance over, I know that I have the coolest car. Until now, nobody knew about my special rocket thrusters. I carefully kept them a secret. Waiting for that special time to impress someone. I gently pull back on the steering wheel and the car goes higher. We’re floating above the street now and we’re moving forward. All of the other cars are still stuck in traffic. I pull back on the wheel and we go higher into the sky and I turn the wheel and we fly over a neighborhood. When you can fly there’s no sense following the roads. My companion is speechless at this point. Unable to contain the excitement. We approach our destination and I gently touch down on the road. We’ve arrived, or at least, I have. Because I have the coolest car. Sroll all the way down the page for access to pics and videos.